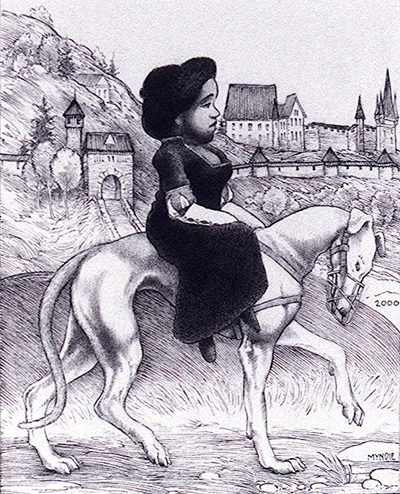 Princess Wee Wee, an African American lady of famously small stature and unfortunate name, is here seen in a composition inspired by a woodcut of a young German princeling riding a pony. A pony might as well be a Clydesdale for Wee Wee, so I thought that given her size a noble greyhound would serve as a more suitable mount. This drawing is dedicated to the memory of Felicity "Bebe" Benoliel, founder of the Creative Artists Network (now called the Center for Emerging Visual Artists), who passed away shortly after adding this drawing to her collection. Bebe's generosity of spirit and unflagging enthusiasm for art in all its manifestations was and continues to be an inspiration for all who knew her, especially for the generation of artists she nurtured through C.A.N. during its first fifteen years. One of Princess Wee Wee's pitchcards may be seen here.